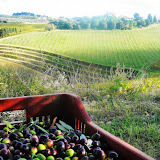 The olive harvest was in action all over Tuscany yesterday. We rode through a wonderland of olive groves being picked by hand, mostly very old women and men laboring on ladders in the trees. We stopped and shared the experience with Anna, in Pisignano, who has worked on her land cultivating and harvesting olives for 69 years. After a couple of hours riding through the live, endless harvest, we arrived at Le Corti wine estate where I gave the olive oil tour while the cold press was in action, which only happens for one month per year. For lunch we tasted the olio nuovo, and savored the bright green, robust and spicy flavor. We then headed back, only to see another vision....tons of grappa being lifted by a crane to be delivered to the distillery. A memorable day. Sunday is the last day of the bike tour season. My company will host a dinner for all associates to bid farewell until we start again in March. While I am sorry to see it go, I am looking forward to devoting my complete attention on living and loving my life right here in Florence.